All my children are back in school. It is a time of change. The long summer days are getting shorter. The clubs and sports activities are starting back up. The laziness of summer has ended. So how are we going to challenge ourselves for this next season? How can we grow spiritually, physically and emotionally? My first goal is to get back to serving a well rounded dinner that we sit down around the table to eat. I want to try to get some exercise at least twice a week. I have some books stacked up that I plan to read and I am going to try to "contain" my working activities to the hours the children are in school. This will make me available to hear about their school day when they come home at 3. It will give me time to help with homework and get that fabulous dinner going. I am going to get to weekday mass twice a week and keep on reading In Conversation with God by Francis Fernandez. And since I am now working Monday through Friday, I am keeping part of my drive time reserved for the rosary and Our Lady. I need her guidance and example most of all. 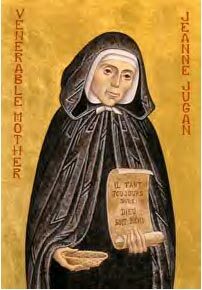 Born in 1792, Jeanne became a domestic servant as a young girl because her father was lost at sea and her family became very poor. Well into her 40s, she was still serving in other peoples homes. One day she saw an old woman about to die alone in a hovel. Jeanne picked her up and brought her home to Jeanne's own bed. In 1839 she and her friends founded the Little Sisters of the Poor. She spent the next 10 years begging on their behalf. She was always humble and lived a hidden life. She died August 29, 1879 and was just cannonized October 11, 2009. Some people in their 40s think their "best" years are gone. But many only just begin to find themselves at this point in midlife. Mother Teresa was in her 40s when she started the Missionaries of Charity. At age 45, I am excited about the things God may be calling me to. With my first child now in college and my "baby" in Kindergarten, I know for sure that He is asking me to share the faith with everyone I meet. What is God calling you to do? "He was led by the Holy Spirit to preach the call to repentance-as Jesus would also do. And for teaching marital faithfulness, he paid the price of martyrdom. 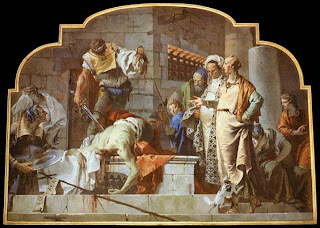 St. John the Baptist is the first adult martyr of the New Testament; he is the only one to die specifically for his witness to the marriage bond." How can we help strengthen marriages today? Is there a couple we can encourage? A couple we can pray for? And our own marriages~do we thank God for the gift of our spouse? Is there some specific way I can serve and love my spouse today? St. Monica is a wonderful example of a mother praying for a child. Her son, Augustine, was a very intelligent but naughty boy. He had no interest in sharing her Catholic faith. He had a mistress and a child out of wedlock. He embraced heretical dogmas and lived a pagan life. But Monica prayed. And she prayed and she prayed. And she tried to share her faith with him and lead him to his higher calling. At the age of 33, Augustine was baptized. At 36, he became a Catholic priest. At 41, he became the Bishop of Hippo and after his death, a cannonized Saint and a doctor of the Church. 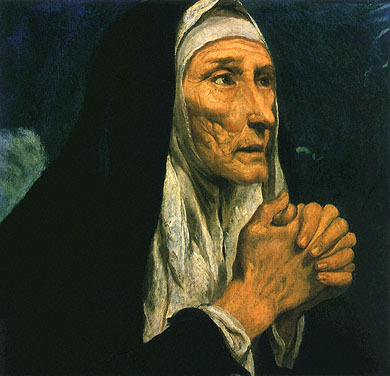 St. Monica helped bring about St. Augustine's conversion by her example, constant prayer and many tears. St. Monica, wise wife and mother, pray for us. My mother always prayed specifically for each of her children on a certain day of the week. Monday was for me, the oldest, Tuesday, my sister Lisa and Wednesday for the youngest, Colleen. She prayed for herself on Thursday and Daddy on Friday. Later as we married and had children she added our whole family to her prayer list. So many Mondays she would call me up and say "I'm praying for you today and for Bob and for the kids and for all the people you work with and for those at your parish." Later she added her own siblings to certain days and prayed for them too. I have adopted this way of praying for my own children and husband. I really like it because it allows me to praise and thank God for each of these special people He has given to me and to interceed for each in the specific ways they each need. Mother Teresa was born 100 years ago today! Think of how much the world has changed since 1910. That makes this quote of hers all the more amazing. "We need to find God, and He cannot be found in noise and restlessness. God is the friend of silence. See how nature -trees, flowers, grass- grows in silence; the moon and the sun, how they move in silence? We need silence to be able to touch souls." As a mother of 6 children ages 5 to 18, I long for silence. "Noise and restlessness" resound most of the day! But I have carved out a few ways to be in silence. First, I try to have my prayer time early in the morning before anyone is awake. I spend about 15 minutes a day reading over the mass readings for the day and then reading the commentary by Francis Fernandez, In Conversation with God. Second, I rarely watch TV. It is never just "on" in the house without someone watching it. If a program is watched by the family, the volume is low. Lastly, I am trying very hard to speak less and listen more. After the example of Our Lady, I want to "ponder these things in my heart." This is the hardest of all for me but when I can force myself to listen, I always feel so good that I did not jump in and start talking before I thought about what to say first. How do you find the silence? Let's honor Our Lady and Mother Teresa by carving out some silence today. The City of St. Louis, MO is named for this king who lived from 1226-1270. He was the father of 10 children with his wife Marguerite of Province. He founded hospitals and personally visited the sick. He daily hosted 13 poor people to his dinner table and during Lent and Advent fed all those who came. We may not be kings or queens, but how do we use the resources God has given us? Are we generous with those less fortunate? Do we welcome children in marriage? Do we use our authority at work, in the neighborhood, or just with friends and family for the greater good? St. Bartholomew, sometimes referred to as Nathaniel, was one of the twelve apostles. His friend Philip brought him to the Lord. Jesus bestowed great praise on meeting him: "Behold a true Israelite in whom there is no guile." 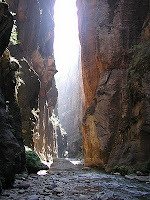 He preached the faith in Arabia and then in Armenia where he was martyred, some believe by flaying. A person like Bartholomew "in whom there is no guile" is a person without pretense. He does not lie. In our culture, perhaps we would say he is not "two-faced." Let's examine our speech today. Do we always and only tell the truth? Our Lord will help us, for He is the Way, the Truth and the Life! Strive to enter through the narrow gate." "Our Lord wants us to play a part in his mission to save mankind, and has provided apostolic zeal as an integral component of the Christian vocation. Let us ask ourselves today in our prayer if the people who know us can readily recognize us as disciples of Christ. Are we not only Christians, but seen to be Christian? Let us consider how many we have helped to take a decisive step on the path to heaven. How many have we spoken to about God, or invited to a recollection, or recommended that they should read a good book which would help their soul to improve? Whom have we helped to go to Confession, or to whom explained the Church's teaching on family or marriage? To whom have we shown the grandeur of being generous in alms giving, in the number of children people have, or in following Christ in an unconditional self-giving? For He whom you did merit to bear, alleluia.Has risen, as he said, alleluia. 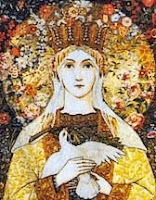 Pray for us to God, alleluia.Rejoice and be glad, O Virgin Mary, alleluia. For the Lord has truly risen, alleluia.Let us pray. O God, who gave joy to the world through the resurrection of Thy Son, our Lord Jesus Christ, grant we beseech Thee, that through the intercession of the Virgin Mary, His Mother, we may obtain the joys of everlasting life. Through the same Christ our Lord. Amen.